Summary: The reigning champion rather exaggerated the number of races held on the Brands Hatch Indy circuit in his quote above, but the sentiment was understood as it’s a track that hasn’t served Shedden well down the years! The season opening event at the Kent circuit proved to be a rollercoaster ride for the Scotsman although the front row, following an impressive qualifying performance, should have been the perfect place to start his title defence. After being tapped into a spin at Paddock Hill Bend on the opening lap, a battle with team-mate Matt Neal in race one followed. Shedden was forced on to the grass at one stage during the pulsating battle and the temperature gauge immediately shot up inside his Honda Civic. It usually only means one thing after an off-track excursion of that nature, and that’s grass in the radiator. That unfortunately proved to be the case and although Shedden pitted to have the grass removed he was left way down the order and out of the points. Shedden then drove out of his skin in the second contest, surging from the back to finish third on the road, but he was later excluded when his car failed ride height regulations during post-race scrutineering. Undeterred by the setback Shedden stormed through the field again in race three to finish second behind Neal – the pair crossing the line side-by-side incredibly separated by just 0.083s. It was a fitting reward for Shedden who had driven well all weekend, but had failed to collect the points haul his efforts arguably deserved. You can see why the Honda driver has endured the feeling of ‘playing catch-up’ ever since that difficult day in March too. He left Brands Hatch down in ninth in the standings before jumping to fifth following a successful event at Donington Park. He then maintained fourth from Thruxton through to Croft, which signalled the mid-season break. He was up to third by Snetterton and found himself second after the Rockingham rounds, before going into the season finale behind Jordan and narrowly trailing his team-mate Neal by just one point. 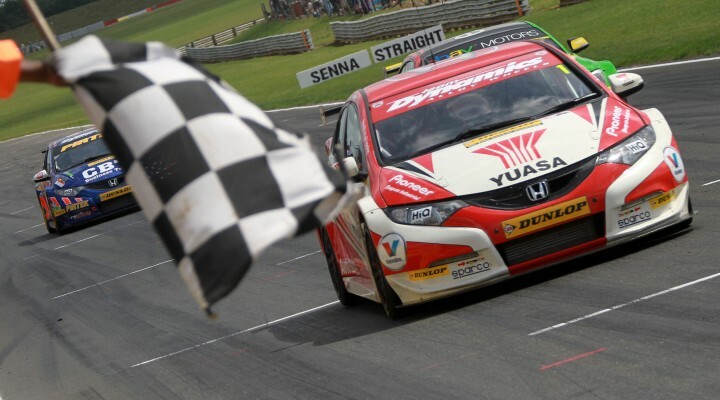 Eventually finishing just seven points behind champion Jordan after an impressive title defence, Shedden did at least get bury one demon on the final day of the season – winning a race at Brands Hatch (albeit on the Grand Prix circuit).